In TradeStation v8.1 and above, my futures chart shows pricing in 1/100 Price units - how do I change this to fractions such as 1/32s? (i) Pre-1996 - Computrac/"MetaStock" format - supporting up to 255 securities per folder. 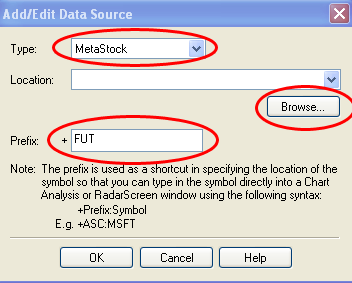 (ii) "MetaStock" 2000-securities-per-folder format - Introduced with MetaStock v6.5 around 1997. (iii) Y2K-compatbile "MetaStock" 2000-securities-per-folder format - Introduced with MetaStock v6.52 in 1999. (iv) "MetaStock" 6000-securities-per-folder format - Introduced with MetaStock v8 in 2002. TradeStation 2000i only supports the first MetaStock format - i.e. only 255 securities per folder. Therefore TradeStation 2000i is only compatible with our Futures and Forex data. However, it is very disappointing that Omega Research have not updated their support of the MetaStock format since the early 1990s, considering that the product retailed for several thousand dollars. This means that TradeStation 2000i is NOT compatible with our ASX or US stock data, which has greater than 255 securities per folder. In 2001, Omega Research Inc changed their name to TradeStation Technologies and went down a brokerage subscription model which had no support for third party data formats. However, in late 2005, TradeStation Technologies Inc. released version 8.1 Service Pack 1 which now supports the fourth format - i.e. 6000-securities-per-folder format. Therefore TradeStation v8.1 Service Pack 1 is compatible with all of our data. 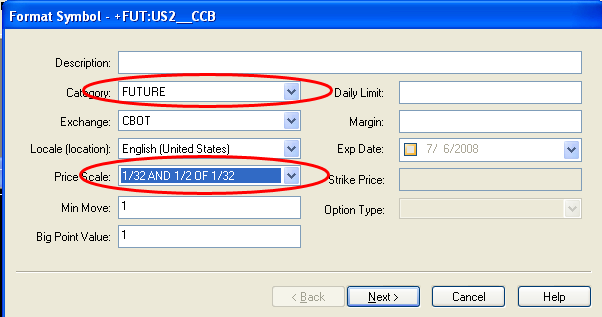 Note that TradeStation version 8.1 and above are only available through a brokerage subscription model. You can then optionally change some of the settings for the security. For certain securities, such as Futures, it is a good idea to select the Future category and also the appropriate price scale for that security, as shown below. Then click Next and then Finish. 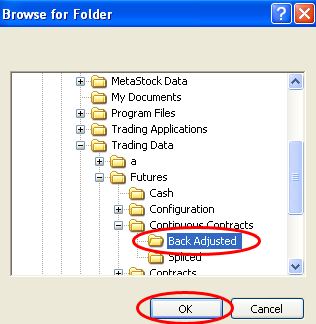 As outlined above, TradeStation 2000i can only read the first 255 securities in a "MetaStock" data folder. This creates a problem with our Futures data where a number of market folders contain more than 255 deliveries - e.g. Gold C, Silver C, Brent Oil, Crude Oil, Heating Oil etc. To work around this issue, DataTools can reduce the number of deliveries in market folders to a specified number by removing the oldest ones first. 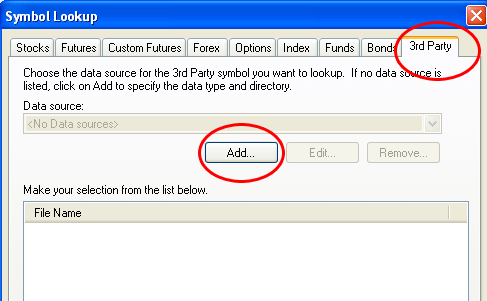 To do this, click Program Utilities -> Reduce Number of Securities in Folders. Note: New delivery months are added all the time, so you may need to run this utility periodically to ensure that folders are kept beneath the 255 limit. If you prefer not to truncate your market histories, please upgrade to a later version of TradeStation, or view the Continuous Contracts instead. TradeStation stores information about the units to be used within a file callled attributes.ini, which is placed into each MetaStock folder. Once a chart has been opened, you are unable to change the units within TradeStation. 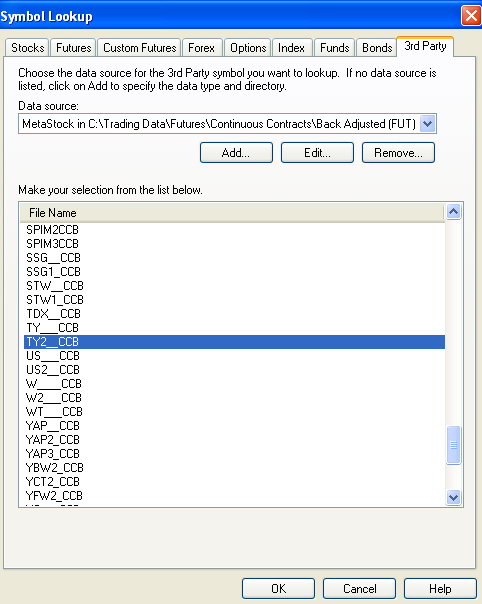 However, you can edit the attributes.ini file, then remove the entry for the security that is showing the wrong units, then follow the steps in the FAQ item "Opening a chart with TradeStation v8.1 and above". 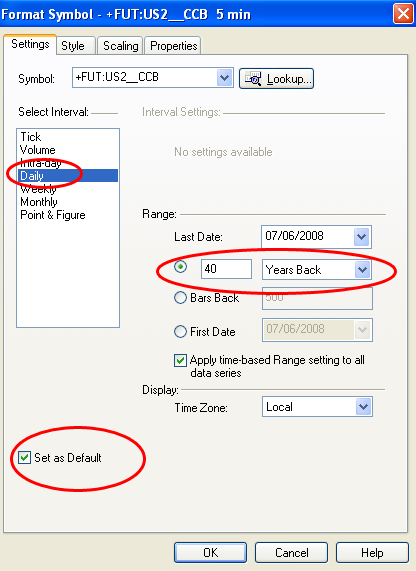 By default, TradeStation 2000i displays data up to to 3 decimal places. If you are looking at certain futures contracts or forex prices, these are often priced down to four or more decimal places. You need to make two changes to show the correct number of places on a chart and also have your indicators use the full accuracy of the data.